A well knit team from Sri Balaji Vidyapeeth participated enthusiastically in the Silver Jubilee 25th International Yoga Festival organized by Department of Tourism, Govt of Puducherry from 4-7th January 2019. The team comprised of members from the Centre for Yoga Therapy, Education and research (CYTER), Mahatma Gandhi Medical College & Research Institute (MGMCRI) and Kasturba Gandhi Nursing College (KGNC). The meritorious team was felicitated by Prof SC Parija, Vice Chancellor of Sri Balaji Vidyapeeth on their excellent efforts to propagate Yoga and Yoga therapy, and he extolled them to keep the flag of SBV flying high at all times. He emphasized the pivotal role CYTER is playing in generating scientific evidence for the benefits of yoga as a therapy in both health and diseased states. He appreciated the efforts made by Dr Ananda and his team to reach out to the community through various programs, and congratulated him on his being selected to receive the highest academic award of DSc (Yoga) from the SVYASA Yoga University this weekend. Prof N Ananthakrishnan, Dean of Faculty and Prof AR Srinivasan Registrar of SBV were present on the occasion and blessed the team for their success. During the Silver Jubilee event, Yogacharya Prof. Ananda Balayogi Bhavanani, Director CYTER gave a talk on “Yoga Therapy in a Medical Setting” and detailed the innovative integration of Yoga therapy with mainstream medicine happening through the MGMCRI of Sri Balaji Vidyapeeth. Yogachemmal Dr Meena Ramanathan, Deputy Director CYTER chaired various Academic Sessions at the festival held at Alliance Francoise Auditorium in French Town. She also presented a paper on “Salutogenic approach of Yoga for Transgender – The CYTER Model” highlighting the gender sensitive approach to healthcare adopted as a policy at Sri Balaji Vidyapeeth. She and Yogachemmal G Dayanidy, Lecturer CYTER led public sessions on “Yoga for the common man” and “Yoga for beginners “at the Tourist Home premises that were well received. Yoga therapy was provided for many dozens of enthusiasts by the CYTER team led by Yogachemmal Dr Meena and consisting of Yogachemmal G Dayanidy, Dr. VR Vasundhara, Dr B Rajalakshmi, Ms. Garima Setia and Ms. Ramya Pillutla over the four days of the festival at Gandhi Tidal. Information was provided to the general public about the opportunities for Yoga therapy as part of patient care in MGMCRI and PG Education in Yoga Therapy at SBV. Dr. Ananda was honored for being the Ex-officio Advisor for the festival and organized various components including the popular Yoga Quiz for the school and college students. He was felicitated by the Chief Minister of Puducherry Shri V Narayasamy and the MLA Shri Lakshminarayanan during the valedictory function. Sri Balaji Vidyapeeth was ably represented by its research scholars from CYTER and MGMCRI who presented their papers in the academic session to high commendation by the audience. Presenters included Yogachemmal Dr. R. Balaji, Yogachemmal G. Dayanidy, Shri S. Artchoudane, Ms. Garima Setia, Yogasadhaka Kiaan Gupta, Mrs. Priya Felix Philip, Mrs. V.V. Mangala Gowri, Ms. Ramya Pillutla, Mrs. S. Vidhyasri, Dr. Rajalakshmi, Shri V Anbhazagan and Dr. Vasundhara. Mrs. M.B. Josephine, Senior Student Welfare Officer, MGMCRI also presented her paper on the occasion. 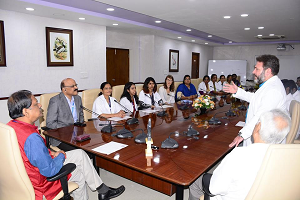 Topics presented included, Yoga module for respiratory problems, Adjuvant yoga therapy may be renal protective in patients of diabetes, Role of yoga therapy in skin diseases, Yoga for digestive disorders, Importance of yogic counselling. Role of yoga in alcohol de-addiction, Benefits of yoga for students, Yoga and type 2 diabetes mellitus, Yoga for mental health, Wellness through yoga for mental health, Integration of yoga with Siddha, Effect of Om chanting on fetal and maternal cardiovascular parameters. Yogachemmal G Dayanidy, Shri S. Artchoudane, Yogachemmal Dr. R. Balaji Research Scholars and Yogachemmal V Anbhazagan, PGDYT student of CYTER were also honured as jury members for the Yogasana Talent Show held at Subalakshmi Mahal. 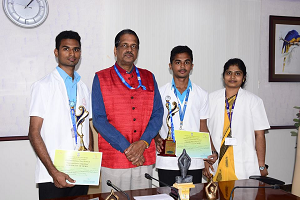 It is notable that the KGNC Team consisting of Shri V Premkumar and Shri Ananthanarayanan (BSc Nursing) bagged a commendable Second Prize in the highly competitive Yoga Quiz event at the college/university level. Sri Balaji Vidyapeeth is one of the top healthcare institutions in the country and is accredited by NAAC with “A” grade and has ranked 72 in the NIRF rankings for the year 2018. Yoga therapy is propagated in an innovative manner through CYTER for all stakeholders of the Deemed University actively for the past 10 years.